Next Post Twas The Night Before Christmas…. I did like it very so much and I reblogged it. So beautiful, heartfelt, with so much love for a loved one, a little daughter. It just broke my heart. Thank you Karen. I should admit that, while I wrote this imagining the calamity this tale unfolds, my daughter, whom (I’ll admit) I envisioned being the victim here, is alive and well. I tried to picture the devastation I’d feel were such a thing to happen and this was the result. She’ll always be my Snow Angel, I hope, for many years to come. Thanks for relating to me your sentiment. I suppose the truth of it is real, somewhere (many wheres) and tears shed, including my own, are not in vain. Karen, I love this poem! It is beautiful! This is delightful – so Christmassy. You have a real poetic talent Karen! I love poetry and can’t wait to read it! Thank you, Karen!! I’m sure I will like it. Sounds like a great read over the Christmas break. I’ll admit I’m not usually much of a poetry fan but that was delightful Karen. 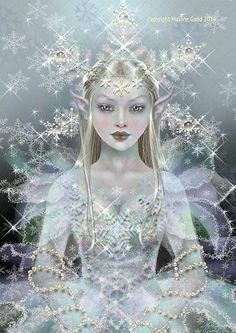 A wonderful touch of magic and fantasy for the Christmas season.